The British newspaper the "Daily Telegraph" has reported a new breakthrough with smart glasses technology which may eventually aid the blind to see. Today's article Smart Glasses Allow Blind to See Guide Dogs for First Time discusses use of new technology developed by scientists at the Nuffield Institute, part of Oxford University in England. The glasses cannot help those with no residual vision, they appear to be vision enhancers. The glasses create black and white images which some blind people can see, then outlines the items directly in the persons vicinity enabling them to avoid dangerous items and allow some facial features to be recognized. I am drawn to the idea of at some future time being able to put on some high tech pair of glasses that would enhance my vision, it is possibly the guy thing. A gadget. A hope of independence. But then I start to think with my heart. 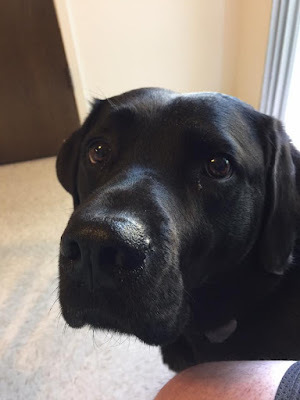 What would life be like without Leif, my guide dog? Would I be happier with a new pair of glasses instead of that cute black rascal who shares my life, 24 hours a day. My heart says, Leif is much more to me than a pair of glasses could ever be. We'll have to see where the glasses thing goes. If it will move forward and change from a large box on ones head to something chique and fashionable. Time will tell, the glasses will get smaller and the technology will be hidden. Maybe in time I could even enjoy the old tech alongside the new tech. Who Knows? Do you have any comments on this article? Leave your comments in our comments section below.